A new superhero film dropped this weekend, and I would not be doing my job as a nerd if I failed to review it the weekend it came out. 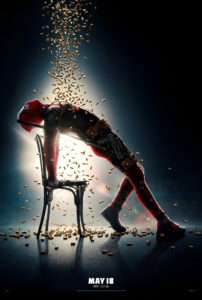 Deadpool 2 is Deadpool 1 with slightly different jokes and a few different characters. There are some cool cameos, call backs, and in-jokes, but please do not expect much more than you got in the first film. I enjoyed Deadpool 2, but know that it’s fairly flat until he assembles his X-Force. After that, we are off to the races with quality action and better-than-act-one dialogue. Ryan Reynolds is fine, but Zazie Beetz as Domino and Josh Brolin as Cable steal the show. Both of the characters are great additions to the franchise, and they are perfectly cast. The character of Domino might be the most exciting new character I’ve seen in a hero move in a while…her power? She’s lucky. Yep, that’s it. But it plays well. And in a world with giant metal guys, and people that can explode on command, why can’t you believe that there’s a character that’s just plain ol’ lucky? It also helps that the power is written well into the script. I don’t want to spoil all of the cameos and secrets, but there are a bunch, and you should see this film before people start spoiling things because the things that will be spoiled in this film are not huge secret plot points; it’s things like Deadpool’s mom is played by Charlize Theron. No, that’s not in the film…it was just an example, but Brad Pitt might be. Oh, and Spider-Man dies. Here’s some good news: you do not need to sit through the entirety of the credits. After the mid-credit time-travel, you can leave; there is nothing at the end. I should have taken a clue from all the nerds leaving to figure that out, but you know FOMO and all. Don’t expect Black Panther but also, don’t expect Spider-Man 3 (Yikes!). This movie will give you exactly what you expect, unless you expect Spider-Man to live.